For about six weeks, from mid-April through May depending on the weather, one of nature’s most glorious foods comes in: the delicious, the marvelous morel. These aromatic mushrooms have a nutty, even chocolately flavor, and the texture is meaty yet delicate. They make intensely savory sauces, are fabulous stuffed and fried, divine as garnishes for smooth soups, and, when tossed into soft scrambled eggs, are simply the best thing on earth. Morels are the fruiting body of Morchella, a fungus that grows in a mutually beneficial relationship with the roots of certain trees. When the host tree dies, the morels flush in abundance in order to release their spores and find a new, healthy host. As morel hunters say, find the tree and you find the morel. Morels have a thick stalk and a pitted or ridged cap that looks like a conical brain. They vary in color from blond to brunette to grey, depending on the species, and range from 3/4 of an inch to 5 inches tall, sometimes weighing as much as a pound. All morels are wild-crafted, either by local hunters or by migrant pickers that hunt in national forests with park licenses, and sold to a handful of distribution companies or directly to restaurants and grocers. They are expensiveexpect to pay $28 to $60 a pound freshbut worth every penny. If you should be so lucky as to have more morels than you can eat fresh within a few days of picking, then drying is a good preservation method. Morels must be dried until less than ten percent moisture remains to insure no microorganism can grow. That’s crisp enough to be easily broken. If you need to keep the morels in the fridge for a day or two before drying, place them in a loosely closed paper bag in the fridge. The key to staving off spoilage is to keep them cool and dry, with a little ventilation. There are three techniques: drying in a food dryer, air drying, and oven drying. To prepare the morels for drying, soak in cold salted water for a few minutes, and then shake them gently to loosen any grit. Do not allow them to soak for long as morels absorb water and will be harder to dry. Allow to drain thoroughly. Split large mushrooms (over 2 1/2 inches tall) in half, longitudinally. Do not put the morels in the fridge after they have been washed. 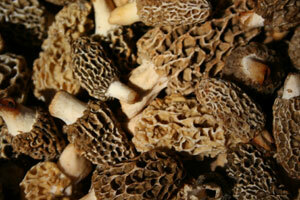 To dry in a food dryer, place the clean morels in the dryer and set at 110 degrees for 8 - 10 hours. To air dry, thread a poultry needle with light culinary twine or dental floss and string clean morels longitudinally. Hang the strings in a dry, ventilated place for about 36 hours. To dry in an oven, thread each mushroom through the stem with a needle threaded with about 6 inches of dental floss. Tie the mushrooms to a rack in your oven so they hang caps down and are well separated: adjust your oven racks to accommodate two layers of hanging morels, if you have that many. Remove any unused racks. Set the oven at the lowest temperature you can and leave the door partially open. If your oven is too hot (over 140 degrees), you may end up cooking the mushrooms, rather than simply removing all moisture from them. Many ovens cannot be set below 200 degrees, so set the oven to “warm” and leave the oven door partially open. Set the oven to the convection bake feature if you have one, as this will keep the air rotating. The mushrooms will dry in 8 - 10 hours, depending on their size. Properly dried morels should be brittle and broken easily. Pack dried morels in freezer jars (a gallon of fresh morels will produce a quart of dried) and freeze for up to a year. You can also store them at room temperature in an airtight container but there will be some flavor loss over time. If your morels are not 90% moisture-freeif they feel leathery, for example--it’s okay, but then you must freeze them.